PRODUCT DESCRIPTION: Odorless liquid which is added to your tank mix for "egg killing" insect control. Although it will do nothing to adult pests, it will essentially "interrupt" the natural progression of eggs and larva so they're unable to develop into adults thus breaking their life cycle. 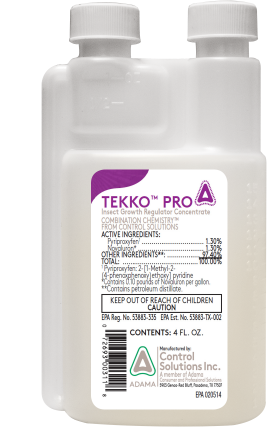 Most commonly used for fleas, gnats, mosquitoes, ants, all kinds of beetles and other pests, adding Tekko to your tank mix will insure you get control of you pest problem and in the long run, cut down on how often you need to treat and how much adulticide you need to apply (basically using Nylar will help by saving time and reducing chemical costs). RATE OF APPLICATION: 1 oz added to the tank mix with an adulticide per gallon of water and will treat 750-1500 sq/ft. Common adulticides used with Tekko would inclulde Permethrin, Deltamethrin, Bifenthrin and more.